Our designer completed the plans over the weekend and they look great! So, now we begin the process of acquiring the proper permits. Unfortunately, our plans do not comply with all Elizabeth Township zoning codes. Specifically, we want to build closer than 30 feet from the property line. The plans call for the garage to be 21 feet 11 inches from the property line. We will need a variance from the Zoning Board. The Zoning Board could also take issue with our preferred driveway location. We would like to enter from the highway, like our neighbors do. However, due to the traffic on that road, they might prefer that we enter from the back of the property. That would add significantly to our costs. It is impossible to get answers to our questions right now because the Township Office appears to be closed for two weeks. We also still have the septic issue. Due to the particularly cold and long winter in Pennsylvania, we still have not completed the perk test. Assuming the property passes the test, we will need another variance to proceed with building the drainage field in the only spot on the property that meets the 100 feet from the closest well rule. The code requires that there are at least two locations on the property that meet the drainage field location requirements. So, we need to find favor with the Sewage Board. Besides zoning and sewage permits, we also need a building permit. We cannot request a building permit until after we have passed through zoning and sewage. We are not sure how the building permit agency will deal with the fact that we are renovating part of an existing structure and adding new construction. This is an odd situation that could trip up our permit application. The Ephrata National Bank has graciously accepted our loan application. Other banks were not interested in this project. However, the bank is waiting for us to acquire permits from Zoning, Sewage, and Building. Of course, the bank has a deadline for us to present the permits to them. So, the way forward appears very complicated right now. Nancy and I are in the midst of the moving process. I believe the research that concludes that moving is one of the most stressful common activities. I suspect the stress comes in part because of the feeling that everything that normally feels permanent is now temporary. 1. Our house, the place where we feel safe, the place where we are comfortable, the place where we go to escape stress is for sale. In a sense, it no longer belongs to us. At any moment, potential buyers could call and ask to walk through. Our privacy has disappeared. We now live as if we are on display. This is stressful. 2. Our stuff; our food, our clothes, the things we use daily, the things we haven’t seen for several years, has all moved. 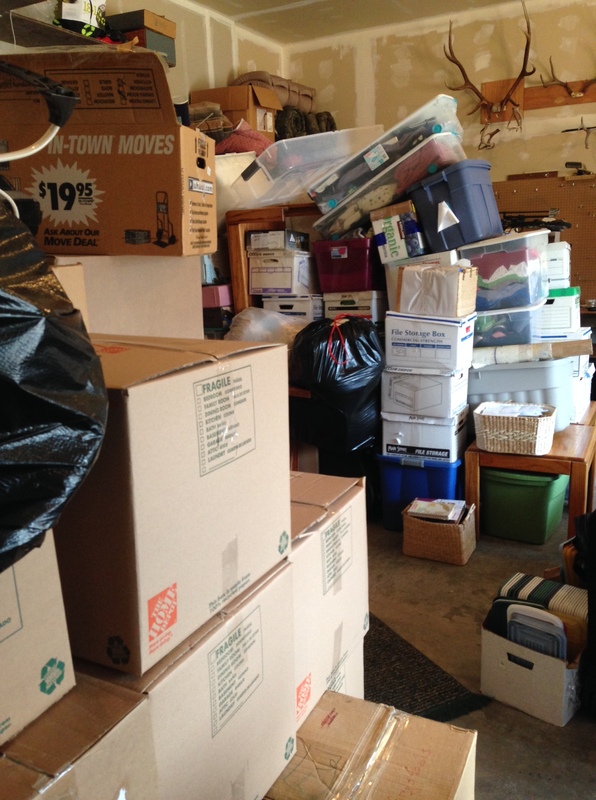 Most of it is boxed in the garage. Some of it has gone to charity and friends. Some was found to no longer have any value and thrown out! It has all moved and some of it has moved somewhere where it can’t be found. For example, I need to inflate the tires on my hand dolly, but I can’t find my air pump! 3. Our Spokane relational connections. The people who we have grown to love and enjoy seeing regularly. We are leaving neighbors, church friends, and colleagues. These people will no longer be close and we are mourning their loss. 4. Our favorite doctors, dentist, mechanic, grocers, etc. It took years to find these people. We have grown to depend on them. We trust them and enjoy their service to us. Leaving them and facing the challenge of replacing them is daunting. This feeling of change and loss is a good reminder that everything that is seen is temporary. It is the unseen things that last. It is short-sighted to depend on houses, stuff, relationships, vendors, or anything that will not endure beyond this world. We feel the living space will flow well and will comfortably suite our needs. Because we are choosing to value preserving the character of the church building, I expected that we would need to accept some compromises regarding our living space. I expected that it would cost too much to both preserve the old and acquire all we would like in a new home. 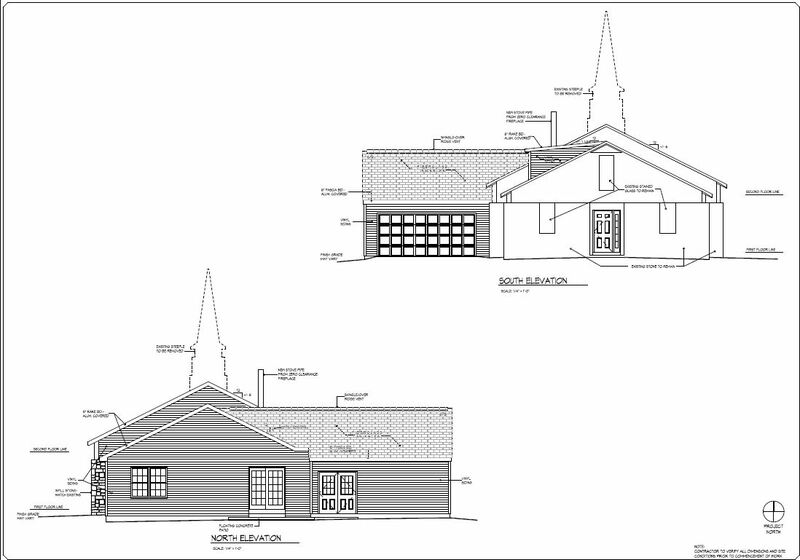 I am pleasantly surprised that it looks like we will be able to transform the church structure into an under 2000 square foot house that wonderfully fits our lifestyle, and do it within our budget constraints. 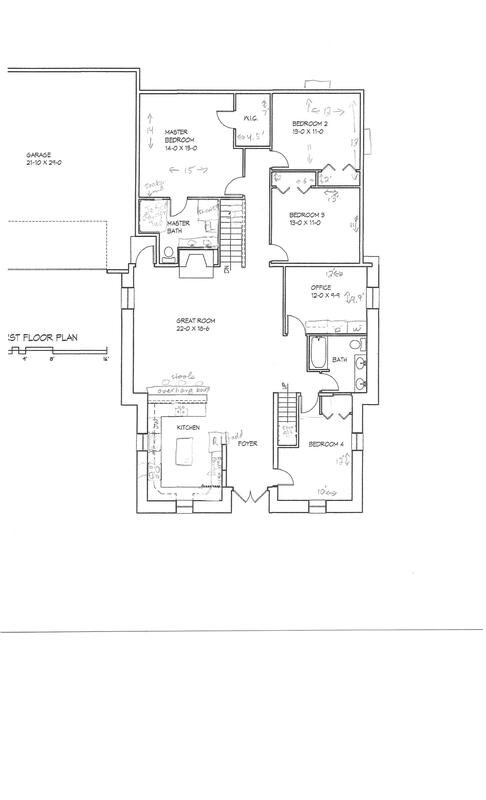 You might be able to see from the sketch above that we are choosing an open floor plan with the kitchen and halls to the bedrooms open to the great room. There will be a counter/bar peninsula between the kitchen and the great room. The dining area will be at the kitchen end of the great room and lunches might often be eaten at the bar. We will have two full bathrooms and four bedrooms – good for hosting guests. Nancy’s office/craft room will double as the laundry and my office will be in a gabled/attic area up stairs primarily over the foyer. There will be a basement under the master bedroom and bedrooms 2 and 3. We will also have a large garage. The two windows in the kitchen and the two in bedroom 4 are stained glass. There is also a stained glass window in what will become my office. Now that the plans are almost finished, we will soon start the process of acquiring clearance from the Zoning Board and appropriate building permits. We also need to complete the septic system peculation test. We are going to seek waivers from the township for the septic system and location of the garage as our current plans are not compliant with the zoning codes. The leader of every project must determine what to do and when to do it. To help with these decisions I create lists. For example, with our “Church to House” project, I have two lists in my Evernote App. The “Must Do” list captures tasks that are critical and urgent. The “Should Do” list captures tasks that are not immediately critical. The should-do tasks probably will be completed someday, but they are not currently high priority. Generally, the should-do tasks are pushed aside. I don’t pay much attention to them unless something needs to move to the must-do list or a particularly good opportunity comes up. The second scenario happened. Lukas and Matt are 20-something year old friends in Lancaster County. Nancy and I have known both of them since they were babies. Currently they work as arborists, but they are both planning to leave the area within the next few weeks. They are willing to take on some extra jobs before they go. 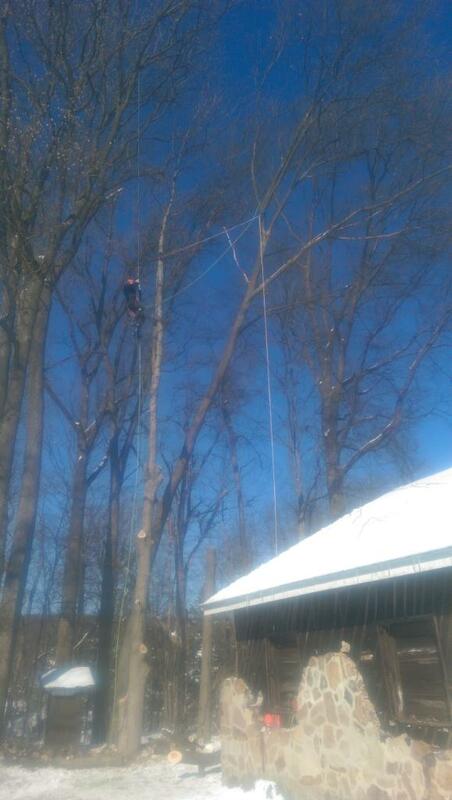 Even though taking care of tree issues is not a top priority for me right now, it will be within the next year. If I hire these guys now I will give them work and I will have confidence of getting excellent service at a reduced (friends and family) price. Spending extra money now will cut costs in the long run. So, this week I hired Lukas and Matt cut down a dozen or so trees that were too close to the building. I hope to find a number of these “coincidental” scenarios as we complete this project. With God’s help we will see these kinds of win-win opportunities that will enable us to be a blessing to others and keep our costs in check. For me, this is one of the joys of leadership. It requires creativity and flexibility when prioritizing tasks.